From the Manufacturer; This beautifully designed Jack in the Box displays scenes from the classic story of Puff, The Magic Dragon. 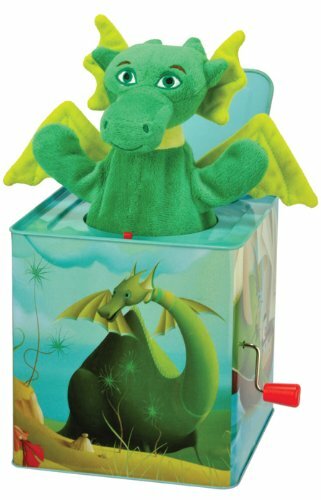 Unlike any other, this unique Jack in the Box features the Puff, The Magic Dragon song. Once the music has finished, out comes Puff to say hello. ; Puff, The Magic Dragon Jack in the Box. This beautifully designed Jack in the Box displays scenes from the classic story of Puff, The Magic Dragon. Unlike any other, this unique Jack in the Box features the Puff, The Magic Dragon song! Once the music has finished, out comes Puff to say hello. ; From the Manufacturer; This beautifully designed Jack in the Box displays scenes from the classic story of Puff, The Magic Dragon. Unlike any other, this unique Jack in the Box features the Puff, The Magic Dragon song. Once the music has finished, out comes Puff to say hello.